Muslim Brotherhood, Islamist activists in Jordanian parliament push government to end peace with Israel over Judaism's holiest site. 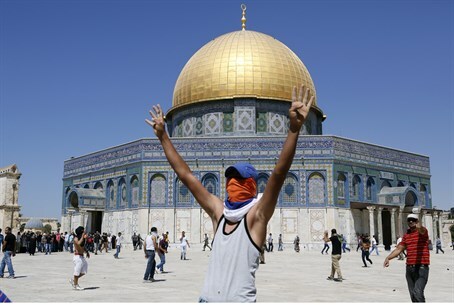 Jordan's opposition Islamists called on the government to freeze a 1994 peace treaty with Israel as the Knesset was Tuesday to debate Israeli sovereignty over the Temple Mount, according to AFP. "We urge the government to meet the demands of people who have repeatedly called for freezing and eventually cancelling the peace treaty," the Islamic Action Front said on its website. The demands come on the eve of a unique debate in the Knesset Tuesday, which is due to discuss for the first time since the Six-Day War in 1967 the right to freedom of religion the Temple Mount. The Mount is Judaism's holiest site, but Jews have been prevented from praying there and often from visiting there due to religious and political pressure from the Muslim Waqf. Prime Minister Binyamin Netanyahu is allegedly opposed to the bill for religious freedom, which is spearheaded by MK Moshe Feiglin (Likud). But the Islamic Action Front , the political arm of Jordan's branch of the Muslim Brotherhood and main opposition party, said the planned debate "proves that Jordanian policies in dealing with the enemy (Israel) have failed." Under the peace treaty, Jordan controls Muslim holy sites in Jerusalem. The Temple Mount falls under this category, despite being Judaism's holiest site and the site of the two Temples, and the Muslim world has been adamant about keeping it in their hands. "The custodianship is a Jordanian national interest and a sacred religious duty," the Action Front claimed. Jordanian officials were not immediately available for comment. The Action Front statement came as Israeli police were stormed Tuesday morning by Palestinian Arab rioters. Two police officers were injured. Arabs continuously accuse Israel of "Judaizing" the Temple Mount, sometimes resorting to illogical accusations, such as saying that Israel is using chemicals to erode the foundations of the mosque in order to cause it to collapse. Some Palestinian Authority (PA) officials have claimed that Israel was trying to build a new Holy Temple on the Temple Mount, replacing the Al-Aqsa Mosque. PA Chairman Mahmoud Abbas himself has made claims to this effect. The reality is that it is Jews, not Arabs, who are discriminated against when they want to visit the Temple Mount. Israeli police, in an attempt to appease the Muslim Waqf which was left in charge of the compound after the 1967 Six Day War, ban Jews from praying or performing any other form of worship. Police sometimes close the Mount to Jews altogether in response to Muslim riots - for days or weeks at a time - despite evidence that such violence is usually planned in advance for the specific purpose of forcing Jews out. The Waqf, meanwhile, works to remove any Jewish presence on the Mount and consistently destroys Jewish antiquities on the compound in a direct violation of a ruling by the Supreme Court. Most recently, the Waqf issued a pamphlet that makes argues, among other things, that King Solomon was a Muslim and that there is no Jewish connection to either the Temple Mount or the Western Wall (Kotel).